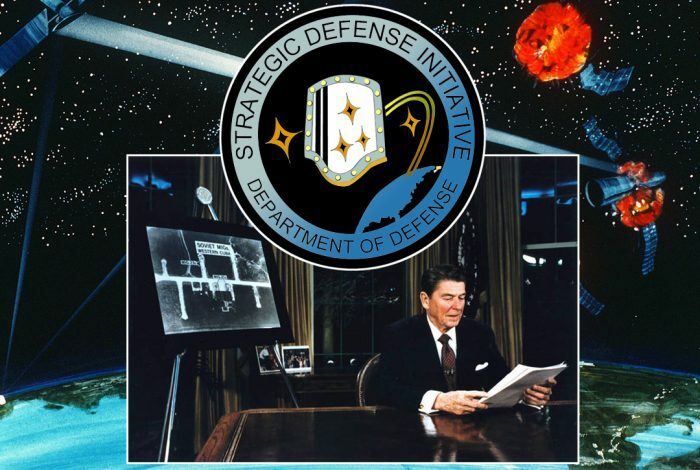 Ronald Reagan's Strategic Defense Initiative, a multibillion-dollar exercise in “perception management.” Photo credit: Adapted by WhoWhatWhy from The White House / Wikimedia, US Air Force / Wikimedia, and US Air Force / Wikimedia. Initial indications show the test met requirements. So, success! Kind of. The rocket’s red glare, the bombs bursting in air do not make me giddy with anticipation. After reading breathless accounts of this great advance — the first in two years for the problem-plagued system — I fetched my old notebooks. My beat for a while was covering Reagan’s Strategic Defense Initiative (SDI) — better known as “Star Wars”— for leading trade publications whose audience was mostly military contractors and wannabe techno-geeks looking to cash in on the illusion of “strategic” (meaning really important, like life-saving) missile defense. Inevitably, that was one-upped by Dr. Edward Teller, proud papa of the H-bomb, who late in life conjured up Brilliant Pebbles, a world-girdling net of satellites that would spray out little nuke-bombs against a Soviet attack, giving a new twist to the old problem of fallout. Mostly, these “demonstrations of concept” consisted of then state-of-the-art illustrations and computer animations of startlingly realistic cartoon laser-beams zapping incoming missiles with deadly efficiency that has yet to be duplicated in reality. Once in space it would mix hydrogen with fluoride on board to shoot chemical lasers at Soviet missiles. Reagan gushed over this big, new toy. Little did he know that hidden beneath the flag-draped gold foil of the Zenith Star was the dented and rusting hull of an old model for NASA’s Manned Orbiting Laboratory that had been sold as scrap to a local farmer 25 years earlier, then tracked down, hastily repurchased and hauled back as a prop for Reagan’s big show. Later that year, Reagan and Soviet leader Gorbachev signed the Intermediate Nuclear Forces (INF) treaty that reduced the number of nuclear weapons by 2,600 warheads. Disarmament proved far more efficient and less costly than SDI, but proponents claimed that the mere threat of success forced the Soviets to abandon the field. Even today, warporn websites tout Zenith Star as the (non-functioning) “weapon that won the Cold War.” Spoil-sport Democrats cut SDI’s funding anyway, in 1991. The first real-time, battlefield test of anti-missile missiles came in the Gulf War when Iraq invaded Kuwait in August 1990. Iraqi troops behaved insufficiently barbarically, so stories were invented about them ripping babies from incubators. The US assembled a punitive expedition based in Saudi Arabia — to the outrage of the Saudis’ former CIA retainer, Osama bin Laden — that flushed Iraqi forces out of Kuwait with “smart” bombs and “precision-guided” cruise missiles, then conventionally slaughtered them in the infamous “Turkey Shoot” as they fled down highway 80 toward Basra. But Saddam Hussein launched 42 Soviet-made “Scud” missiles at Israel in hopes of provoking Israeli retaliation that would rally other Arab countries to his cause. Remember Arthur “the Scud Stud” Kent of NBC, standing bravely against Saddam in Israel while our Patriots knocked the evil Scuds from the sky? Well, he told me privately at a conference that he was disgusted at having been fed successes that weren’t. By tinkering with the Scuds’ guidance system to extend their range, Saddam’s engineers greatly reduced their accuracy. Most of the Scuds fell short of their targets, all on their own, as did the duds Uncle Sam, on behalf of plucky David/Israel, sent up to intercept Goliath/Iraq. The real war was the battle for “perception management” of the taxpaying population that demanded some way to extinguish threats of impending doom with magical counter-doom. In late 1991, however, I lost my job chronicling the approach of doomsday when the US and soon-to-be-former Soviet Union signed the Strategic Arms Limitation Treaty (START) that limited the signatories to 6,000 nuclear warheads on a maximum 1,600 bombers and ICBMs. The putative end of the Cold War sent SDI into mothballs until the Bush-Cheney presidency revived the sleeping project as a National Missile Defense (NMD) to be shared with grateful allies. The scaled-down version of SDI was now justified as a screen against terrorists; a new round of tests began after 9/11. This required unilateral withdrawal over Russian objections from the 1972 treaty that banned Anti-Ballistic Missile (ABM) systems — an agreement intended to slow the ever-escalating race to protect one’s own missiles with ever-more elaborate and expensive counter-measures to guarantee the ability to retaliate. The Army’s abandoned Safeguard ABM was an appropriate illustration of the dilemma: Developed over 20 years and deployed in 1969 at a cost of $23 billion (in year 2000 dollars) its mission was not to protect people in cities but the silos in rural North Dakota from which Minuteman missiles could be launched to annihilate Soviet cities. Yet the first operational battery was shut down after only 4 months because it was too expensive to operate for what little security its phased-array radar was supposed to provide. …development issues discovered after three programs prematurely committed to production continue to disrupt both interceptor production and flight test schedules. In addition, two other programs plan to make premature commitments to production before testing confirms their designs work as intended. MDA is planning to fly targets for the first time in its first operational test using several systems, adding risk that key information may not be obtained in this major test. In short, a waste of money. Instead, fanciful illusions of impunity stoked by audience-convincing “successes” helped pave the road to the hell of Iraq and Afghanistan and generated so-called asymmetrical wars that resemble a lethal game of whack-a-mole where missiles are useless. Nonetheless, the Air Force finally deployed its version of the Navy’s tactical Aegis anti-missile missile in Europe in 2011; both are built by Lockheed and RCA to track and kill incoming short- to medium-range missiles. Instead of greater security, the much-touted but mostly fictional advances in telemetry and avionics only stoked Russian fears that the US was again determined to gain an unstoppable first-strike capability, relaunching the Cold War in the paranoid style of nuclear war-gamers since Dr. Strangelove. In his effort to “reset” the US-Russian dynamic, President Obama scaled back plans to expand the largely unworkable system in Eastern Europe, Japan and south Korea, while continuing limited tests from Kwajelein as a purported negotiating tool, as much to appease his own generals and congressional districts addicted to military spending. Obama also signed a new, expanded version of START that further limited the number of weapons that can be deployed to 1,550 on 700 missiles or bombers, still plenty of overkill. Now, President Trump has threatened to withdraw from INF and allow New START to expire next year. A new batch of “low-yield” nuclear warheads is marching off the assembly lines at the Department of Energy’s Pantex facility near Amarillo, TX to be set atop intermediate range missiles in nuclear submarines for deployment on hair-trigger alert around the world. Each 5-kilotons weapon is the size of the bomb that levelled Hiroshima in 1945. A new generation of space-based weaponry is moving out of the closet and back onto the Pentagon’s drawing boards, with Iran and North Korea the immediate targets and, beyond, Russia and China in the cross-hairs. At the risk of redundancy, a new Space Force has been cobbled together from programs currently split between the Army, Navy and Air Force to carry on war in space, not to be confused with the existing Space Command of the Strategic Command or the new Space Development Agency that overlaps NASA. Nearly 40 years and $1 trillion or so since Teller projected the idea of Star Wars onto the receptive screen of Reagan’s imagination, the only tests that have “worked” — missiles launched at missiles launched from Kwajalein — were programmed “visualizations” (really, really realistic mock-ups) made to appear to “work” whether they did or not, which of course they didn’t. The simulated attacking missile’s trajectory, its exact coordinates, had to be programmed into the intercepting missile’s guidance system — an entirely unrealistic way to track an evasive drop of rain in a ballistic hurricane. And for all that, they still failed more often than not. Cynics might well imagine the real target of the recent test is Congress: MDA’s proposed budget has been cut from $9.9 to $9.5 billion next year. Swarms of laser-armed drones are the next big thing while it studies a how to integrate the ineffective ground-based layers with a still-mythical space-based system to detect and destroy enemy missiles in their “boost phase,” just like Reagan’s Zenith Star but now much-reduced in size, if not cost, thanks to advances in digital electronics. 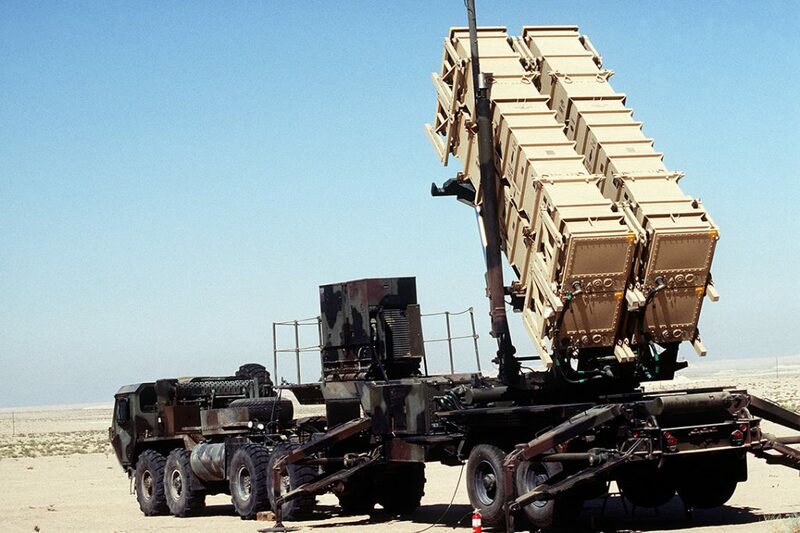 Missile defense is always playing catch-up to offense. It was Vice President Cheney who coined the 1 percent doctrine — if there was even a 1 percent chance of doom, it had to be stopped, whatever the price. A very lucrative formula for the corporate purveyors of endless doom. So the Pentagon’s latest claim of missile-interception success is not news, it’s a replay of old PR, resurrected and shot into the ether of Blue Sky propaganda to knock down Putin’s equally loud claim of success in launching the “invincible” Avangard “glide vehicle,” a hypersonic (meaning, really, really fast) missile — even faster than the ones the US couldn’t shoot down earlier. What the Pentagon is now hyping is a plan to throw “salvos” of more, better, faster, smarter rocks at enemy rockets and, at best, knock down maybe 10 percent of the incoming missiles. The other 90 percent — or even 1 percent — that get through will kill millions of humans. Progress is always elusive, just over the horizon, but now coming at you even faster. And more expensive. Really, really.